Panasonic RP-CDHX15 review | What Hi-Fi? The last Panasonic HDMI cable to feature in What Hi-Fi? Sound and Vision was a huge disappointment and did well to escape our testing rooms with a one-star review. Nevertheless, the Japanese manufacturer seems determined to make an impact in this sector of the market, for it is now back with a new flagship cable. Unfortunately, Panasonic needn't have bothered. 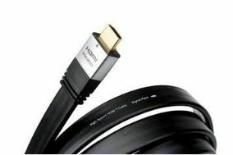 This HDMI cable's slim black jacket and chunky connectors are the only real highlights of what is otherwise a cable to forget. Colours lack richness, while sharpness and detail levels fall way short of what we'd expect from an HDMI cable at this price. The usually pristine image on our Quantum Of Solace Blu-ray disc lacks depth and Daniel Craig's chiseled face undoubtedly appears softer than it should. Sonically, the 'CDHX15 doesn't fare much better, either. The cable digs up a decent level of detail, but dynamically it can be bettered. During the opening forest battle of Gladiator the score and on-screen carnage doesn't display enough clout or drama. The cable doesn't give low frequencies enough weight. The harsh reality is that the 'CDHX15 is put to shame by rivals costing half its hefty £100 asking price. So, if you're looking for an upgrade, then we'd suggest you skip this opportunity and take a look at massively superior alternatives from the likes of QED and The Chord Company.